A few months ago I tried a 10-day cleanse. I had to eat "clean" for 10 days and it actually wasn't as hard as I had expected it to be. I came across this recipe for a clean hummus and it was a great way to make veggies more interesting. It was rather easy, and only required getting out my food processor (although cleaning food processors are never fun...ha!). The recipe here is actually called Clean Hummus by Audrea's Aunt Sandy, but since I don't know who Andrea or Aunt Sandy is (I do have one though), I am just calling it Clean Hummus. I also added in some cayenne pepper and some fresh ground black pepper because I thought it was a little bland. Now season to taste and start by adding slowly. What I think is a ton may not be the same as what you think a ton is. 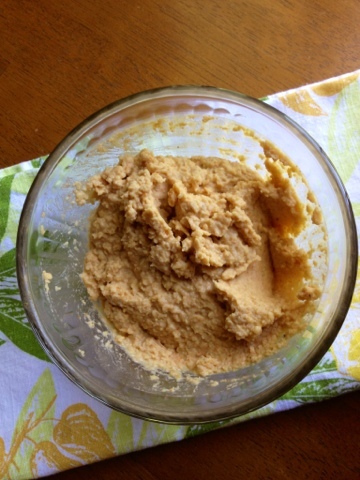 Please note that tahini looks like peanut butter, but it is really a paste of ground sesame seeds. I had an aweful time trying to find this, but finally found at Krogers in the organic peanut butter section. It looks like a jar of peanut butter, but more expensive -- like $8. I put it in my fridge to last longer. Blend in food processor a long time (The recipe said 10ish minutes, but I think I maybe mixed it for about 3-4 mins). Add more lemon juice (or olive oil depending on your taste, the more lemon juice you add the more it will taste like lemon) for a good consistency. For lunch over the weekend I had a little crudite type plate out on the patio. 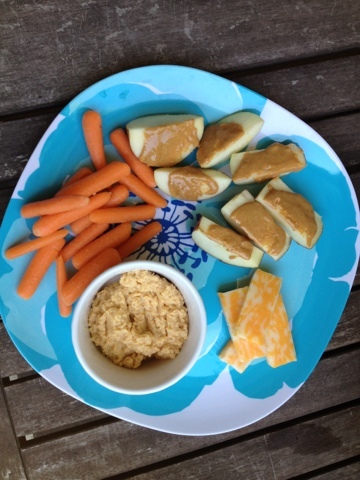 Some carrots with the clean hummus, cheese and apples with peanut butter is a great summer lunch or snack. And very heathy especially if you use the natural peanut butter that is just ground peanuts and nothing else. Meijer has an organic brand version of this that is great. No salt or other ingredients, just ground peanuts...yum!